In today's Michelle Obama news, the first lady busted out some random dance moves at an Alexandria school. 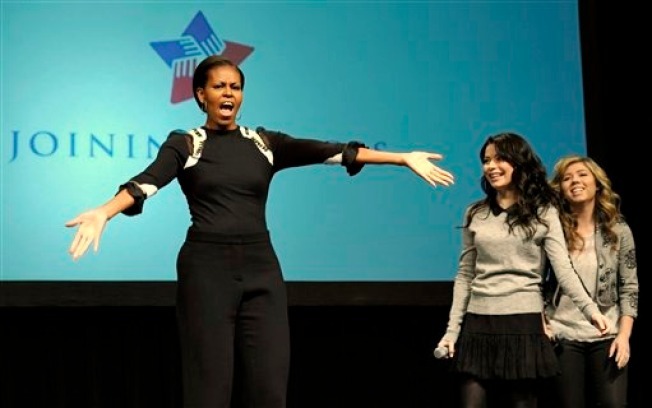 Mrs. Obama joined cast members of the Nickelodeon's "iCarly" Friday at Hayfield Secondary School in Fairfax County, which teaches grades 7-12. The audience got a special preview of an upcoming episode featuring Mrs. Obama thanking the families of military members for supporting their work. On the show, star Miranda Cosgrove plays the daughter of an Air Force colonel. The first lady thanked the military kids in the audience for their sacrifices: "...[T]hat's something that we want the other kids who aren't military kids to know, is that when you find a kid who is a military kid, who has come in new, it's important for you all to do like iCarly's friends did and step up and know the kind of struggles and challenges that they're facing." "Because it's not easy changing schools every few years and keeping your grades up, and knowing that your dad is away serving in another part of the world," she told an eighth-grader named Antonio. The first lady's press office promised Mrs. Obama would participate in "random dancing," a staple of the Nickelodeon show -- and yes, she delivered. The dancing was indeed random, including some bouncing, clapping, and an arm move that vaguely resembled the Mashed Potato. Last year, she wowed the students at Alice Deal Middle School in the District, when she joined in a dance routine that featured the Dougie and the Running Man. Mrs. Obama also took questions from students from the health-related ("What are your efforts on school lunches, and could you change ours?") to the simply fun (what her super power should be). Regarding school lunches, the first lady cited new legislation, and told the crowd, "You should be seeing more fruits, more vegetables, more healthy foods" in their school. More importantly, she commented on super powers, telling the crowd, "You know what, I've always wanted to fly. You know? When I was young, I used to always have dreams about flying. Has anyone had a dream about flying?" "I love that [the student who asked that question] was concerned that you're not powerful enough," joked an iCarly cast nember. "He's like, how could you be more powerful? "I could fly," the first lady quipped.